Warframe is a stunning free online action game from Digital Extremes, makers of Dark Sector and The Darkness 2. 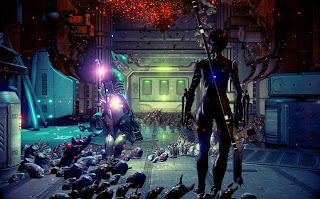 Warframe is based on the same ideas of the Dark Sector universe and offers co-op gameplay where high-tech ninjas fight in a world that blends Manga and Dune. The exciting action gameplay is acrobatic and relentless and immediately captured the attention of over a million players in less than two weeks. The studio is also constantly adding new features, Warframes (the main characters with very different abilities), animations and locations. Warframe is one of the best F2P action shooters of 2013, highly polished and with very compelling gameplay that every kind of player will enjoy.